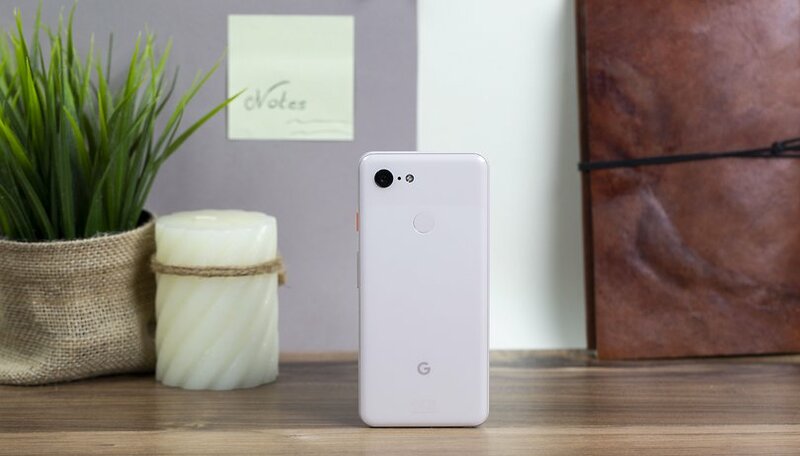 The Google Pixel 3 is one of only a few Android smartphones to offer top hardware in a handy format. But the star of the show should also be the software this year, to set the phone apart from the competition. Whether the combination succeeds or not is something we reveal in our review. You chose the World Camera Champion, and it's the Pixel 2! Like its predecessor, the Pixel 3 is available in two memory variants. For $799 you can get the model with 64 GB of storage, and for $899 you can get the device with 128 GB of storage. There is a choice of three colors, Just Black, Clearly White and Not Pink. You can order the new Pixel 3 on the Google Store right now. It became available in the US on October 18th on Verizon. It has also now launched in the UK (From £739) and in India. On the outside, the Pixel 3 looks like a shrunken Pixel 2 XL at first glance. The bezels above and below the 5.5-inch display have slimmed considerably , but still offer enough space for the two front-facing stereo speakers. The design isn't super modern, but it looks less outdated than the Pixel 2. Instead of a metal body with an embedded glass pane, the whole of the back is made of glass and features a matte finish for the first time. Nevertheless, Google optically separates the upper quarter of the back from the rest and thus again offers that instantly recognizable design of its Pixel phones. Everything is well made, the device sits nicely in the hand and upon picking it up, it's really fun to once again hold a phone in your hand that can be operated with one hand without any problems. The metal frame has a shiny finish just like the upper part of the back, which has a striking accent on our model in the colour "Not Pink" with the orange power button. The volume rocker is just below and, unlike the standby button, is as glossy as the frame. The Pixel 3 is excellently processed and is less slippery than the glass-slathered models of most competitors, above all due to its matt coating. It's also a real pleasure to once again have a top-of-the-line smartphone in your hand that's easy to use with just one hand - even when you're working on one of Google's thicker sleeves. The Pixel 3 features a 5.5-inch 18:9 display, which has a resolution of 2,160 x 1,080 pixels (FHD+). Despite the OLED panel, the colors don't look quite as bright as on a Samsung. For color display, users can choose between "Natural", "Enhanced" and "Adaptive" modes. A manual adjustment of the color temperature is not possible. In addition to sRGB, the display also covers the DCI-P3 color space used in cinemas. The color fidelity is very good, while OLED contrast and black levels are typically outside the measurable range. Google itself speaks of a contrast ratio of 100,000:1. The Pixel 3, of course, also supports the playback of HDR content. The display brightness is high enough to keep content readable even in direct sunlight, and in the evening hours the brightness can be finely adjusted and turned down enough not to be dazzled too much by the screen. But it doesn't come close to the maximum brightness of a Galaxy Note9 or iPhone XS. The Pixel 3 also comes with the so-called Active Edge feature , which has remained untouched in its functionality: by pressing the frame, users can either call up Google Assistant or mute an incoming call. Sensitivity can still be adjusted manually, but other functions cannot be assigned. The Google Pixel 3 runs smoothly with the current Android version 9.0 Pie and delivers that pure Android feeling. The new swipe gesture navigation is activated by default and cannot be deactivated manually to return to the familiar three buttons. However, gesture navigation doesn't work as well as on the iPhone XS, for example. With a full-screen app, you first have to fade in the navigation bar by swiping upwards and then reach the Home screen by wiping a second time. However, the swiping gesture used to fade in many apps is considered an input at the bottom of the display and often leads to wrong actions being triggered. Switching between apps by swiping over the bar also doesn't work well with lots of open apps. Here, you have to hold your finger at the right end to scroll to the left to "older" apps. If you want to open the corresponding app, you have to let go at the right moment or you'll end up in the wrong app. Other features like Always Listening for Now Playing, Google's automatic music recognition (finally with history), and Google Lens are deeply integrated into the system. The dark mode can now be activated manually, but still only for the quick settings and the launcher, not for settings or other system applications. Apart from that only the new live backgrounds, which I already liked on the predecessor, stand out. The performance requires fewer words: Qualcomm's high-end Snapdragon 845 chip does a good job in combination with pure Android . But that was to be expected. However, the SoC could have been equipped with more than the built-in 4 GB of RAM, which is currently sufficient according to experience, but could soon be pushed to the limits with smartphone apps becoming more and more sophisticated in the future. Google also urgently needs to provide a patch for better RAM management. Currently, older processes are thrown out of memory abnormally fast, which hinders multi-tasking. Here, the Pixel 2 with the same amount of RAM and a less powerful SoC cuts a better figure in some situations. For more information on performance, see our detailed analysis of Pixel 3 XL, which includes benchmark and gaming tests. There are no surprises with the internal memory. There are either 64 or 128 GB options available, but again no memory expansion. Heavy data eaters will probably have to use another smartphone or find a cloud solution. The latter is of course what Google is pushing, which is why Pixel 3 buyers are again given unlimited online storage space for photos and videos for just over three years. Otherwise, under the hood you'll find flagship standard equipment: Bluetooth 5.0 + LE, NFC, LTE Cat 16 and Wi-Fi a/b/g/n/ac (2.4 & 5 GHz), GPS, Glonass, Beidou and Galileo. The USB type-C port also supports USB 3.1 for high transfer rates. New is the security chip called Titan M, which is responsible for the security of your personal data on your smartphone. Even though the wide display edges of the Pixel 3 look a bit old-fashioned, they do have one big advantage: they offer space for two front-facing stereo speakers. They also delivered good sound when we tried them out for the first time, and mid-range and treble seem to be well balanced. Google says the speakers are 40% louder on the Pixel 3 than on the Pixel 2. We also didn't notice any distortion at maximum volume. In addition, there's a bass that makes the whole smartphone vibrate, but is less powerful than the large Pixel 3 XL. In my opinion, this is less disturbing, while other colleagues find the feedback quite good. Like its predecessor, the Pixel 3 doesn't have a 3.5mm headphone jack . So, if you own high-quality jack headphones, you'll have to use the USB-C adapter. As an alternative, Google includes a USB headset in the style of its Pixel Buds with the smartphone. We prefer Bluetooth headphones, though. New Pixel owners will also get six months' of YouTube Music with the purchase of their new device. Ok, this year Google can't do without a dual camera . However, this is located on the front and consists of two 8-megapixel sensors (f/1.8 & f/2.2 aperture), one of which is available for wide-angle shots. Google has also improved the portrait mode and wants to get more out of HDR recordings with better algorithms. However, 4K videos can still only be recorded at a maximum of 30 frames per second and Full HD recordings at 30, 60 or 120 frames per second are also possible. A time-lapse function is still missing. Google has also worked on the camera app for the Pixel 3, where it now jumps through the various standard modes by swiping horizontally. Further modes "hide" in the More section. This is a bit more comfortable and more intuitive than the side menu of the predecessor. The new panorama mode, on the other hand, is modest and not only awkward to operate, but also rarely delivers satisfactory results. At 2,915 mAh, the Pixel 3's battery is slightly larger than that of its predecessor . But it must also supply a slightly larger display with energy. At the end of the day, The Pixel 3 offers only a similar average battery life as The Pixel 2. During the test period, I usually had display-on times of about five hours with mixed use of music and movie streaming, browsing social networks and surfing the Internet. On days with very intensive use, however, the Pixel 3 ran out of before at 21:00. Here the deactivation of the Always-On display could provide some improvement. But if you want to use your smartphone intensively every day and take a lot of photos, surf the internet, chat and so on, you will soon reach your limits with the Pixel 3. Especially if you want to go out with friends after a working day in the evening, you should recharge your Pixel 3 before you leave the house. This shows that no amount of software adjustment can compensate for the small battery. The Pixel 3 battery is recharged via the USB-C port on the bottom and it also supports quick charging. If you don't want to find a plug into the socket, the Google smartphone, thanks to the glass back, now also supports wireless charging. The Pixel 3 is one of the few reasonably handy Android smartphones with top equipment on the market and already stands out from the current high-end competition. It was a real pleasure to use over the course of my review and to finally be able to operate a smartphone with one hand again without any problems. So if you're looking for exactly that, you should definitely narrow down your selection to the Pixel 3. Here you get one of the best smartphones with pure Android, fast updates and once again one of the best smartphone cameras on the market. In addition, there are reasonable loudspeakers, wireless charging, good voice quality when calling and good performance. However, you also have to accept some losses. Battery life is average due to the smaller power source, and will cause problems for users who use their phone frequently over many hours a day. Also the current problems with the RAM management still have to be solved urgently. For owners of a Pixel 2 there are, however, few reasons for an upgrade apart from wireless charging if you are still satisfied with your current model. The most important innovations, the camera features, are also available for the older Pixel models. Those who also value things such as expandable memory, a headphone jack or more camera options such as telephoto or wide-angle lens are better off with the competition. Last but not least it is important to address the elephant in the room: The price for Pixel 3 is especially steep for users with large memory requirements (128 GB). You already get two Galaxy S9s for the same money. Here we have to advise you to wait for sales in which Pixel 3 is reduced by 200 dollars or so, for example, but Pixel smartphones are usually quite stable in price. Those who are aware of the weaknesses and still want a Pixel 3 will not be disappointed. I like the size of the Pixel 3 since it's close to the size of the Pixel 2 I have. One handed use is why I have the 2. For me the high price of the 3 is what's keeping me with my Pixel 2. And I have most of the software updates from the Pixel 3 already on my Pixel 2. My choice would be the regular pixal3. No notch and now a 5.5 in display is considered small. I really think it's the perfect size. The only downside is 64gb's of storage & 4gb's of ram. I did expect more. But I do think this will out sell the 3XL?